Thread: light blue, black, white, light pink, pink, green Use a single thread to sew. 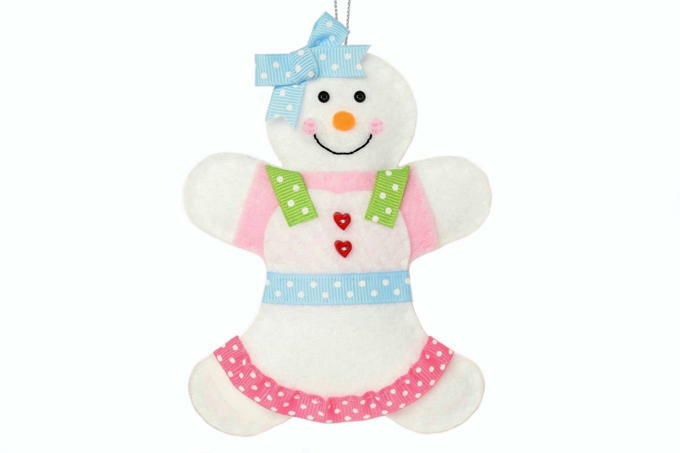 Print the Felt Snow Girl Patterns on paper or cardstock. Cut them out on the outside of the lines. 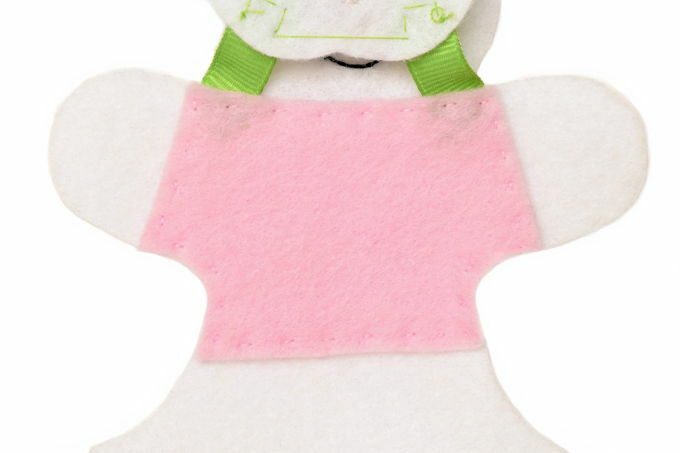 Lay the body pattern on white felt and trace around it with a pencil to make the front. Then trace around it again on another part of the felt to make the back. Use fabric scissors to cut them out inside the pencil lines. Lay the body pieces on top of each other to make sure they’re exact. Cut out one dress from the white felt, one shirt from the pink felt, and 1 nose from the orange felt. Make a small bow 1½” wide with the blue ribbon. As you make the bow, twist the ribbon so the dots show from the front. Cut a V out of the ends. To seal the cut ends, gently touch the craft glue along the raw edge. Let it dry. Using the light blue thread, hand-sew the bow on the head (off to the left a little). Sew it in four places just under the center of the bow so the stitches are hidden. Use black thread to sew on the button eyes. Glue on the orange nose. Lay a copy of the pattern on the face over a light source so you can see through the paper to line up the nose. 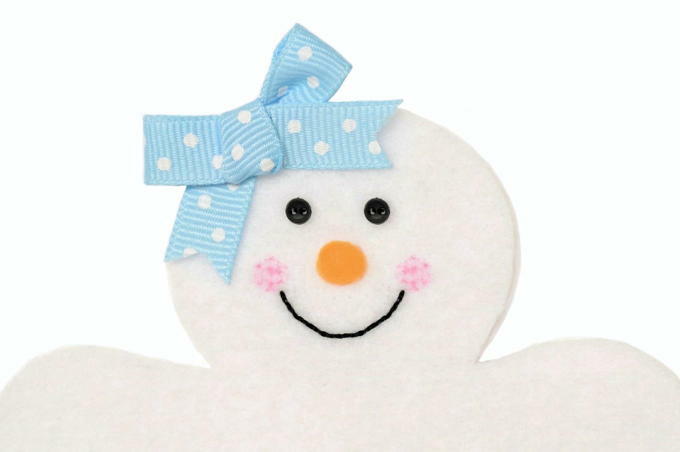 Use a fairly thick embroidery needle to poke through the smile on the paper and the felt. This makes a faint dot hole pattern of where to sew the smile. Use 2 strands of the black embroidery floss to back stitch the smile. 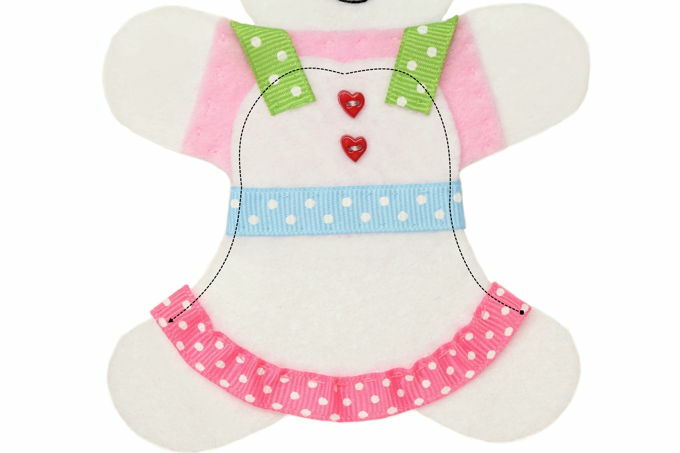 See Embroidery Stitches (Back, Split, and Satin) Directions. Use a paint brush to wet a disk of pink watercolor. Gently and carefully brush a small pink circle to make each cheek. Use a light blue thread to sew a 2¾” piece of blue ribbon on the back, across the waist, and then finish on the back. 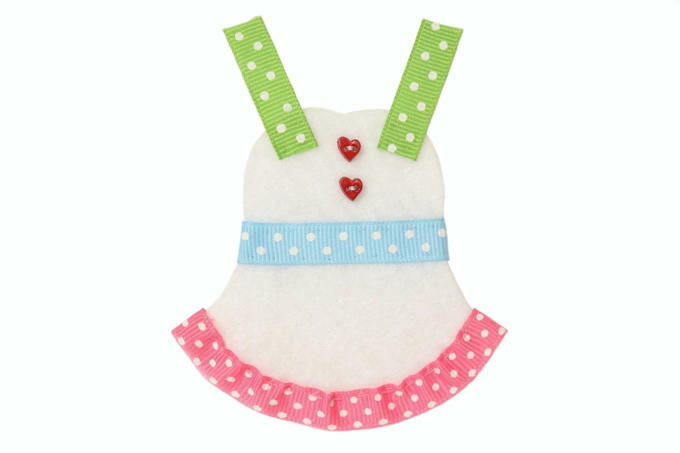 Use white thread to sew two red button hearts to the center top of the dress. Cut a piece of pink ribbon 6 inches long. With pink thread, hand-sew a basting stitch along an edge of the ribbon. Don’t knot it, instead, leave a long tail. This will allow you to pull the thread to gather the ribbon so it looks like a ruffle. Wrap the end of the ribbon around the back of the dress and sew it down. Pull on that loose thread to make the ruffle as wavy as you’d like. Then sew the gathered ribbon to the bottom of the dress over the basting stitches. Sew it down on the back – when you’re to the end and cut off any extra ribbon. Knot and trim that loose basted thread. Cut two pieces of green ribbon 1¼” long. To seal the ends that will be on the front of the dress, gently touch craft glue along the edge. Let them dry. Using green thread, sew the glued ends of the green ribbons to the top of each side of the dress to make straps. Lay the pink felt shirt on the body and make sure the curves under the arms line up. Then lay the dress on top. Make sure the bottom sides of the dress line up with the curve of the legs. You should see some of the pink shirt showing above the dress. Wrap the straps over the pink felt shoulders. 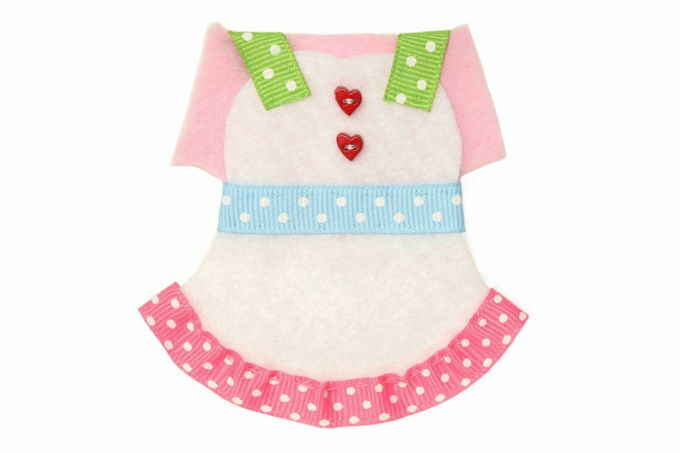 If the green ribbon on the back shows through the pink felt, trim it a little. Carefully keeping them in place, lift the shirt with the straps still over the shoulders off the body. Turn it over to sew one of the straps down to the back of the shirt. When you’re done sewing one strap, lay it back down on the body and line it up again. Then wrap the other strap behind, like you did the first, and sew it. Once they’re both sewn, check it again on the body to make sure it all still lines up. Line the shirt up on the body again but lift up the dress. Sew the shirt to the body with light pink thread. Use a simple running stitch along the outside of the shirt. Use small stitches on the front and larger stitches on the back. Lay the dress back down on the shirt and body and line it up. Sew the dress to the body using white thread by starting on the side by the ruffle. Sew up to the top and down the other side, stopping at the other ruffle. Do not sew the bottom of the dress. It will remain loose and not attached to the body. Cut a piece of silver cord 8¼” long. Fold it in half and tie a knot about ¼” from the end. Position that knot on the back of the head with the loop above the head. With white thread, securely sew that knot about ¼” down from the edge. Lay the body on top of the second felt body. Using white thread, sew around the outside of the body to connect them together. Start sewing at the bottom side of one of the feet and go upward. As you sew, be sure to check the stitches on the back to make sure they are where you want them. Also, hide your stitches under the bow, ribbons, shirt, and ruffle. 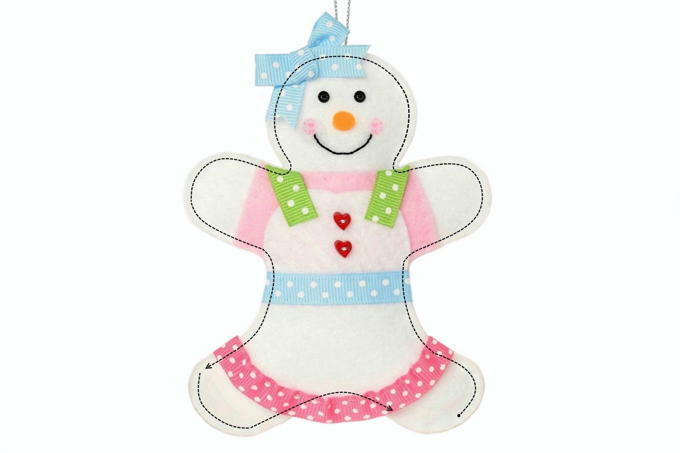 Once it’s been sewn along the top and down the other side to the top of the other foot, start putting stuffing inside the head, arms, and upper body. You want it to look puffy but not too stiff. Continue sewing around the foot and along the bottom of the body. Again, only sew the body pieces together. Do not sew the bottom of the body to the bottom of the dress. Add stuffing to that foot and the lower part of the body. Sew until just an opening the size of your finger remains. Add the last of the stuffing in the remaining foot and then finish sewing back to where you started and it’s closed.